Many people wonder whether it’s worth getting their Rosary blessed. 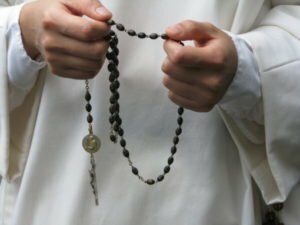 When we have a Rosary, is it necessary to have it blessed? Does it make sense? Or maybe, blessing are something superfluous, or even worst, something comparable to mere superstition? Let’s start saying that blessing an object -or a person- is not superfluous, and we do not have to consider it a magic rite or a good luck charm. As Fr. Amorth (an exorcist priest who died few years ago in odor of sanctity) said: «The meaning of a blessing is not to give a magic protection or “super powers” to an object. It’s about asking God the grace to add virtues in our daily life, as it is indicated in the blessing prayer recited by the priest […]». Sacramentals are sacred signs by which effects, especially spiritual effects, are signified in some imitation of the sacraments and are obtained through the intercession of the Church. Therefore, when we have a blessed object – a Crucifix, a Medal of the Virgin Mary or a Rosary – that very same object acquires a concrete spiritual effect. It is a value that is quite different from an object without the blessing. Sacramentals are not simple “spiritual symbols”, they have something more. Sacramentals – such as holy water or blessed Rosaries – thanks to the special blessing they receive from the priest, acquire a concrete “spiritual effect” thanks to the intercession of the Church itself. That is why it is useful and praiseworthy to get our own Rosary blessed. Otherwise, we couldn’t explain the reason why during exorcisms the reaction of the possessed person is different whether we use simple water or holy water on him. Holy water, thanks to the power of blessing received by the priest, acquires a spiritual effect able to produce unspeakable anguish in devils responsible for the possession. WHO CAN BLESS ROSARY BEADS? As for the blessing of devotional objects, it is necessary a specific blessing of the priest or deacon as it is provided for by the Roman Ritual of Blessings. The blessing that the priest normally imparts at the end of the Mass is addressed to people and not to devotional objects. The blessing of objects – as for Rosary beads – is usually done through the use of holy water. When it is not possible to use prayers provided by the Roman Ritual of Blessings, the priest just makes a simple Sign of the Cross on the object along with a short blessing prayer.